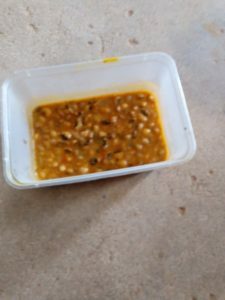 A member of the Nigeria Youth Service Corp (NYSC) has taken to his Twitter page share the type of food being served to them in Adamawa NYSC Orientation Camp. The Corper shared pictures of watery porridge beans and according to him, the food is supposed to sustain them from 7:35am till 2:pm. 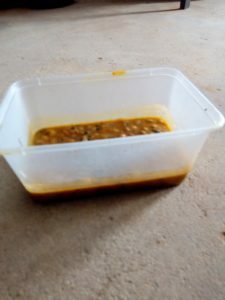 "This is the food served to us early this morning in ADAMAWA NYSC ORIENTATION CAMP at exactly 7:35am which is expected to sustain us till 2:pm. 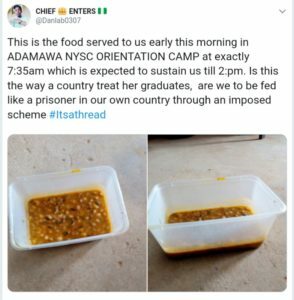 Is this the way a country treat her graduates, are we to be fed like a prisoner in our own country through an imposed scheme #Itsathread"